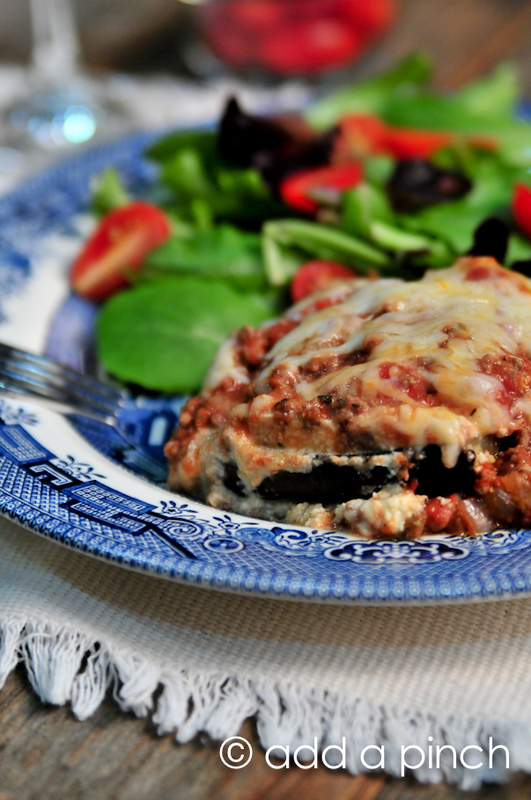 Eggplant Lasagna makes an easy and delicious lasagna recipe the whole family will love! My husband and I both love lasagna. Creamy, rich and comforting, it’s really hard not to love it. But, we’ve also both been watching how much pasta and breads we eat as well. 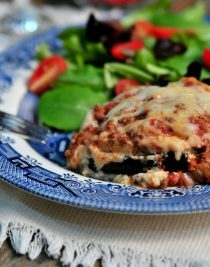 This eggplant lasagna is the perfect solution for a dish with tons of flavor without missing the pasta. It begins with two of these beauties. You can peel them or leave their skins on them, that’s really up to you and your tastes. I prefer to leave the skins on for mine. Then, slice them to about 1/4 of an inch thick or smaller. Or bigger. Again, it’s up to you. I like mine just a bit meaty so my photo shows them thicker than in this recipe. You’ll adjust your roasting time based on the thickness of your slices. 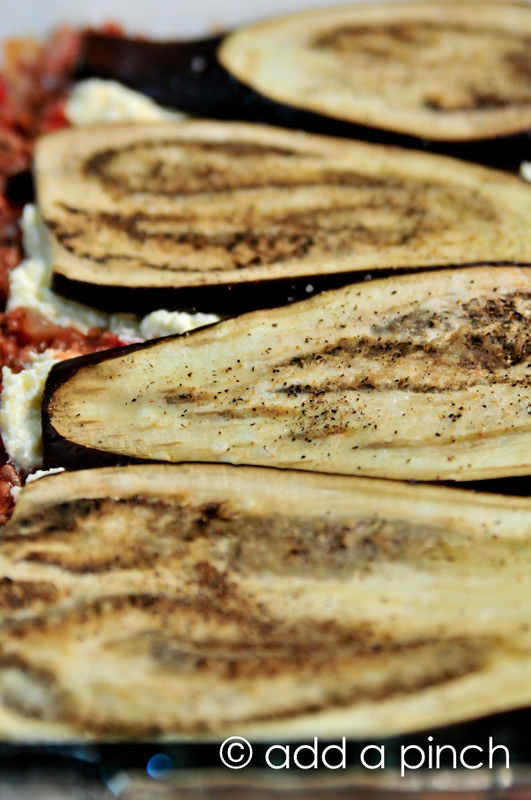 Now, brush your eggplant slices with a little bit of olive oil and sprinkle with salt and pepper. Pop them into your preheated oven and roast them until they are fork tender, about 15 minutes depending on thickness. While your eggplant slices are roasting, you’ll want to prepare your marinara sauce. I like to use this recipe for marinara sauce that is ready really quickly. If you’d like a meaty sauce, go ahead and cook your ground beef or turkey, drain it, and mix it into the marinara sauce. 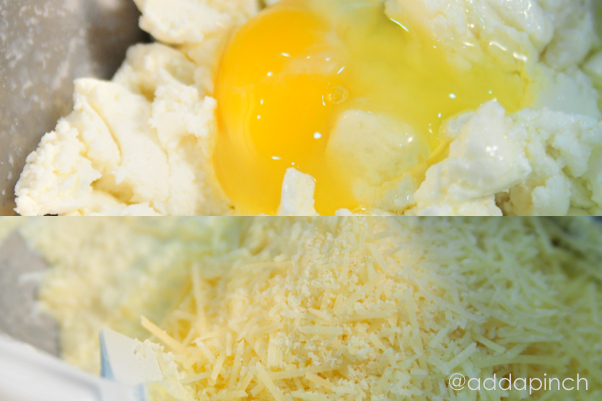 Then, mix up your cheesy layer of Ricotta cheese, eggs, and Parmesan cheese. Top it all off with shredded cheese and bake it until nice and bubbly and the cheese has melted, about 30 minutes. Then, serve it with a nice salad and enjoy every single bite! 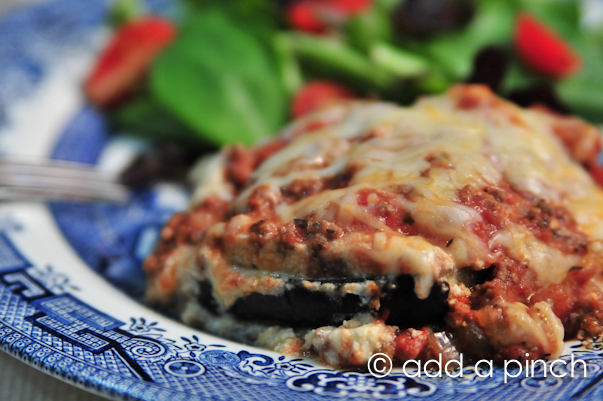 Here’s my Eggplant Lasagna recipe that I think you’ll absolutely love! 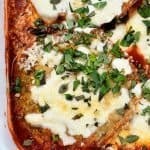 Eggplant Lasagna Recipe - Eggplant Lasagna makes an easy and delicious lasagna recipe the whole family will love! Prepare marinara sauce, including meat if preferred. I made it tonight! I absolutely loved the versatility of the egg plant and the over awesomeness of the dish! It was a tie in my house though, with ages ranging from 3-33 yrs old, not all cared for it. It was a beautiful showing and I used my own marinara sauce, adding spinach (I add spinach to everything) and simmering on low..I absolutely LOVED it! Thanks for such an awesome alternative to pasta! Absolutely delicious! The only thing I added was mushrooms. Calorie count would be nice, but I will try to figure it out. Tried this recipe and it turned out a – ma zing! Everyone enjoyed it. Definitely stored away in my book of favorite recipes. Thank you. Thanks for your recipe with photo instructions! I live in Brazil where eggplant is always in season. I’ve tried three other recipes without great success. I was super happy with the texture and taste of this lasagna. 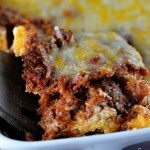 Looking for some lasagna recipes, this look delicious! This was my first time cooking eggplant for any type of recipe. 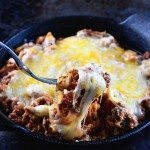 I was really excited to try this because I started low carb this month and I love preparing casserole-type dishes for my husband and I because we get 2-3 nights of dinner out of one casserole so it saves me time during the week. I used store bought, good quality no sugar added marinara sauce to save time and used ground turkey breast as my protein. As far as taste goes, this turned out amazing! It was however, a little hard to cut into squares and the eggplant was just a tad chewy. It seemed fork-tender after roasting for 10 minutes but I do wonder if it was a tad under-done. I will make this again but I need to work on getting the eggplant just right. Thanks for the awesome recipe! Excellent recipe. Made all from scratch, with something like your marinara with additional red pepper flakes for kick. Ground turkey and diced red bell peppers in the sauce completed it. Family loved it. Came upon this as, after a diabetes diagnosis, forced me to give up all bread and pasta. Don.t miss the sugar and carbs. I will be trying this tomorrow for the golf masters on some pasta fueled men, will feedback their critiques. I hope everyone enjoys it, Marianne. Thanks so much – have fun watching the Masters! 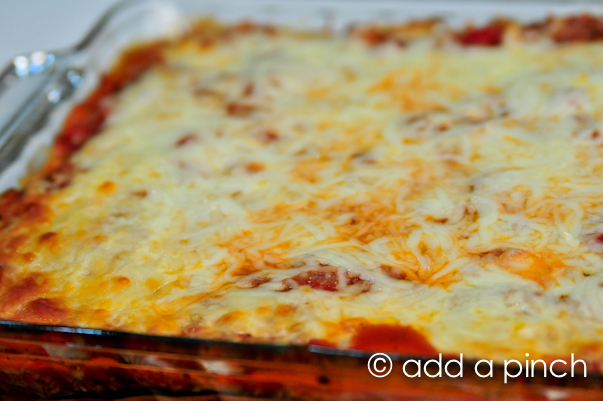 Love this lasagna recipie. Make it on a weekly basis. So happy you enjoy it! Thanks so much! Obsessed! This was so yummy! I made this last night. It was quick and easy. I had garden eggplant so they were not large and i cut them to thin. I did use a large garden zuke and sliced it thicker and used it as a bottom layer to hold it together. i breaded the zuke and baked it first as well. I layered my thin eggplant thicker each layer and it was great. The only thing i couldn’t figure out was what size of pan to use. I used one that turned out way to small. I just made this tonight for my fiancé and he loved it ! He’s a vegetarian and I wanted to try something new yet healthy! 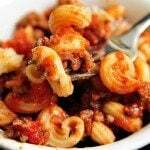 We did not use the meat but we substitute the marinara for tomatoes, parsley, and garlic! Thank y’all so much!! 5 stars!! I made this for my husband and myself. I used my own sauce which could have been saltier. Anyway, I followed instructions exactly, except that I had three layers in a Le Creuset baking dish. I had planned on putting it under the broiler to brown, but didn’t need to. 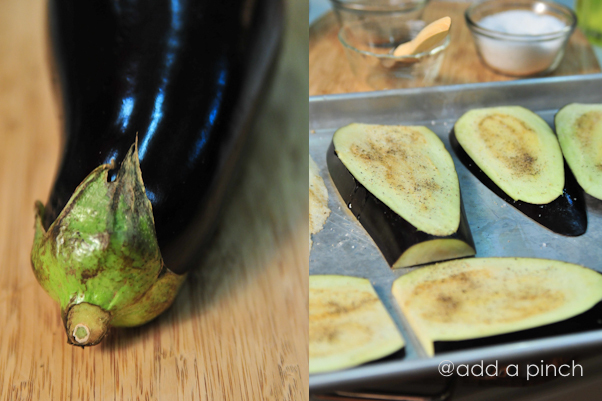 I cut the slices of eggplant about 1/4 to 1/3″ thick and honestly, we loved it. The only reason I gave it 4*s is because I thought it could have used more flavor. If I had put in meat in the sauce, this could definitely replace my mother’s lasagna and that is a high compliment. Made it tonight and thoroughly enjoyed it. I used greound pork and Italian sausage without casing. It turned out so delicious. So happy you enjoyed it, Bob! Thanks so much for sharing that with me! Couldn’t have been easier to make! 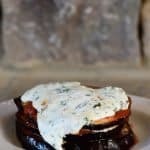 I’m gluten free and received eggplant in my farmshare this week and didn’t know what to do with it, so I googled “eggplant lasagna” and this came up. So glad it did, because it’s DELICIOUS! I ended up using twice the amount of the ricotta mixture and sauce because I had a big dish with a lot of eggplant, but it tastes delicious. As a graduate student with very little cooking experience and very little time to spend fussing over recipes, I’m thankful for easy recipes like this that make larger portions and freeze well. Thanks so much! This makes me so excited to hear, Jess! 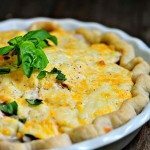 It’s so nice to have freezer friendly and make ahead recipes when you are short on time. I am thrilled that you enjoyed this so much and hope you find more recipes here that help you with meal time! Can I freeze this before baking? Found this recipe as soon as I googled searched for Eggplant lasagna. Last night my family and guests enjoyed it for the first time. I also made the marina sauce. So easy! Will be making this again! I made this without the meat. Delicious! Glad you enjoyed it Rita! Thanks! Can I make this ahead of time and freeze it, then bake it off the day I wish to serve it? Cool completely after baking, then wrap well and store in freezer in air tight container. I hope you enjoy it! Thanks! Robyn…my wife HATES eggplant! Or so she thought. I made this recipe…sort of… She’s not crazy about ground beef or turkey in her lasagna, so I substituted LOTS of fresh spinach. I also cooked up chopped onion and garlic. Layered in the eggplant, this is super. Sometimes I don’t get accurate feedback when I ask “did you like this?” so I’ve substituted the question “would you like me to make this again?” to which she immediately responded YES!!! PLEASE!! Thanks for the ideas! I made the “5 serving” version (reduced everything in half) and omg the leftovers are so good!! I’m about to cry if happiness. I will be adding this to my list of meal prep go-tos!